Flame protective trousers approved for welding and certified for high visiblity class 1, with kneepockets of flame retardant CORDURA®. Durable and comfortable flame retardant treated material with welding reinforcements at front. Tested for 50 cycles in industrial laundry. 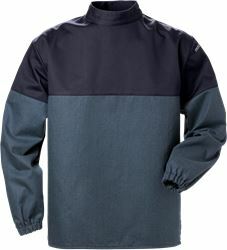 Material: 75% cotton, 24% polyester, 1% anti-static fibre. 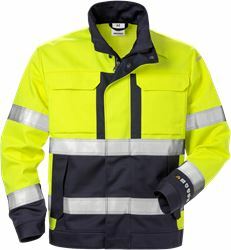 Reinforcement: 74% cotton, 25% para-aramid, 1% anti-static fibre. 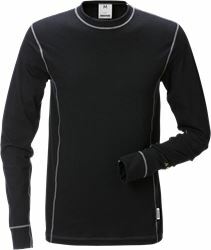 CORDURA® reinforcement: 79% cotton FR, 20% polyamide, 1% antistatic fibre. 2 front pockets / 2 CORDURA® reinforced back pockets with flap and concealed snap fastening / Double reinforced crotch seam / Hammer loop / CORDURA® reinforced folding rule pocket with flap and concealed snap fastening and button and loop for sheath knife / Leg pocket with flap and and concealed snap fastening, mobile phone pocket with flap and velcro fastening, D-ring and ID-card pocket / CORDURA® reinforced knee pockets with inside opening / Height adjustment for knee pads in knee pocket / Aramide reinforced thigh panels / CORDURA® reinforced leg end / Approved according to EN 61482-1-2 class 1, EN 61482-1-1 ATPV 10,6 cal/cm² HAF 80,4% (see Electric arc table for certified garment combinations for EN 61482-1-2 class 2 and open arc according to EN 61482-1-1), EN ISO 11612 A1 B1 C1 E2 F1, EN ISO 11611 A1 class 1 (see Flame and welding table for certified garment combinations for EN 11612 C2, E3, F2 and EN 11611 A1 class 2), EN 1149-5, EN ISO 20471 class 1 and EN 14404 together with kneepads 124292 / Leasing laundry-tested according to ISO 15797 / OEKO-TEX® certified.